I’m working on a WIP of a blue heeler in pen and ink. Well, sometimes, I’m not in a pen and ink mood, and decided to start a second WIP at the same time. This isn’t like me, but it’s actually kind of nice to have more projects going on at once. I love scratchboard. I’m still fairly new to the medium, but it is addicting! One of the most wonderful things about scratchboard is that it can be colored. So I chose something a little different than my usual furry animal portraits. I chose a gorgeous Mandarin Goby, which is about as colorful as any animal can be. I once saw one of these fish in a pet store and could not believe my eyes. They are stunning! The colors too! Unbelievable. In this one small fish alone, there are hues of green, blue, yellow, orange, pink. and black, scattered all across its body in vibrant stripes and spots and bands. The size of this scratchboard is 8×10 inches, and I’m using a simple X-Acto Blade for now. 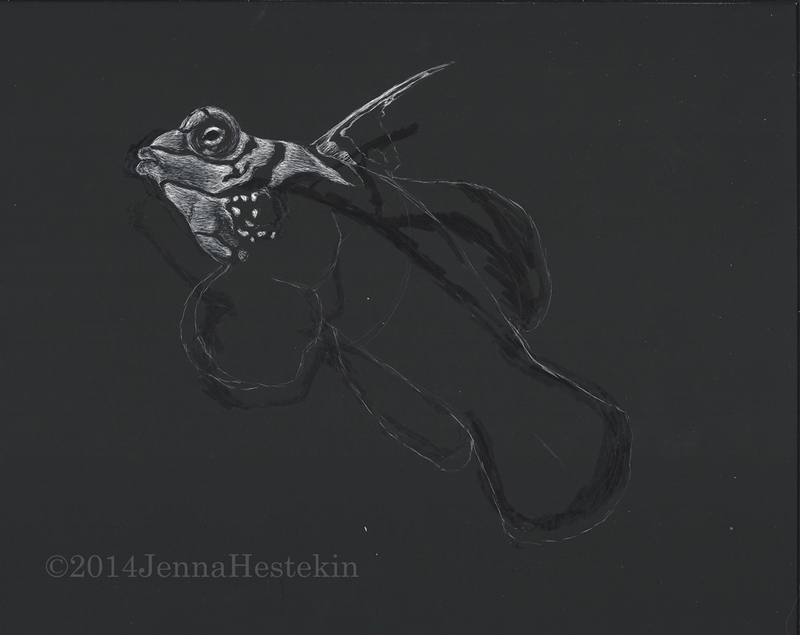 As you can see, I had a complete outline of the fish, which I then had to ink out completely. It looked too small on the board. The new outline, in white, seems to be a better size. I haven’t drawn a fish for years, so they’re a bit different for a change. I’ll, of course, be coloring this scratchboard too, in time. Anyway…I hope you’ll enjoy the WIP, and thank you for looking.